Begin your Hoover Dam tour with pickup in a luxury motor coach from your Las Vegas hotel. At Hoover Dam, you’ll take the Discovery Tour and have time to explore the exhibits on your own. While exploring on your own, head to the Theater Level, where there are murals, maps, photos and other displays that provide an introduction to the Hoover Dam. Watch a short presentation, "How the West was Won," that showcases the part that the Bureau of Reclamation played in taming the rivers, settling the West and growing the country’s food. Next, you’ll visit the power plant generators on the guided Discovery Tour. To get there, you'll take the large elevators 500 feet down into the walls of the Black Canyon to walk through a 250-foot-long tunnel and view the 650-foot-long Nevada wing of the power plant and its eight huge generators. Stand on top of it at the Penstock Viewing Platform, where you can view one of the four 30-foot-diameter pipes that transport nearly 90,000 gallons of water each second from Lake Mead to the hydroelectric generators in the powerhouse. After the Discovery Tour, visit the Exhibit Gallery, which highlights some of the natural history of the region and presents a picture of how the Hoover Dam was constructed and how it presently operates. From the Dam Overlook, you can soak in the beautiful panoramic view of the Dam, Lake Mead and the Colorado River. Then it’s time to leave the heights of Hoover Dam and head down to the water’s level. At Lake Mead Marina, you’ll board the Desert Princess paddle-wheel steamboat for an approximate 90-minute cruise on Lake Mead. 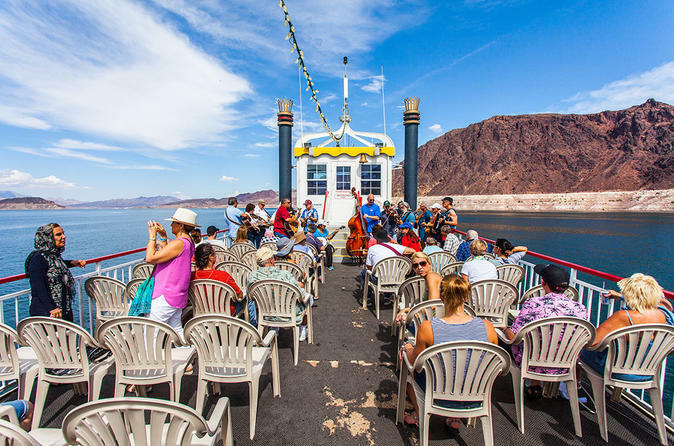 You’ll enjoy your deli-style lunch on board as you travel along Lake Mead and admire new views of Hoover Dam. Depending on local traffic, a 10-15 minute stop will be made at the iconic Welcome to Las Vegas sign for photo opportunities. Special Offer - Book with us and save 27% compared to another travel site! - Book Now!